Haystack Rock on Ilkley Moor, west Yorkshire. Haystack Rock from a different angle. OS Grid Reference: SE 13027 46313. 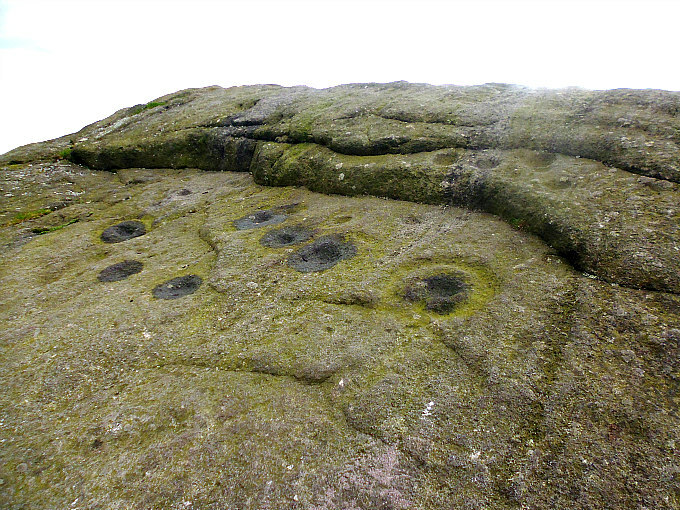 A large and squat-shaped gritstone rock known as Haystack or Haystacks Rock on Ilkley Moor, west Yorkshire, has many cup-and-ring carvings, but also some more recent graffiti. The rock is thought to resemble a haystack and so the name has stuck. 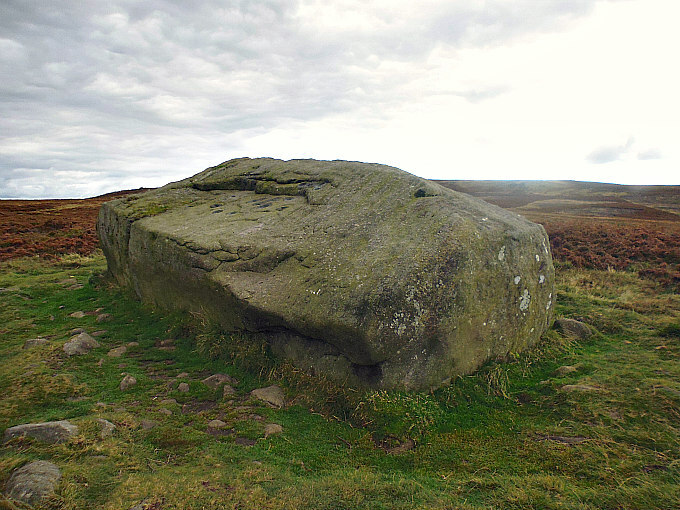 It is just one of many rocks and boulders upon Ilkley Moor, also known as Rombald’s Moor, many of these often strange-shaped rocks having ancient cup-and-ring carvings that date from the Neolithic and Bronze Age periods of prehistory. However, these carvings are often almost ‘lost to the heather’ and not that easy to find – though there are said to be 400 of them on the moor. Best to park at Cow & Calf Rock Café on Hangingstone Lane, then walk up to Cow & Calf rocks and walk along the moorland footpath going southwest for a while, then head south and up onto the footpath along the ridge to Haystack Rock; while on the horizon further in front of you you will see the strange-shaped Pancake Stone perched on the edge of the ridge. 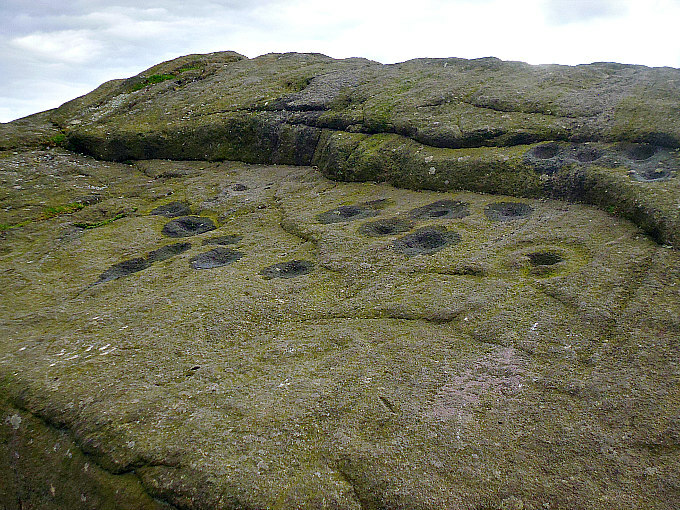 Haystack Rock, Ilkley Moor, with cup-and-ring carvings. Haystack Rock, also known as Rombald’s Moor 141, is a glacial erratic boulder that was deposited here thousands of years ago and then, during the Bronze Age the curious if strange rock-art known as cup-and-rings were carved onto the sloping face of the rock by ancient people who lived in hut circles and settlements on the moor, or they were simply traversing it from one side to the other, building their stone circles and erecting standing stones as they moved around. The climate at this time would have been much milder in the Winter than what it is today. The millstone grit boulder is 2m high and over 5m in length, and resembles a haystack depending on what angle you are viewing it from. There are said to be 70 cup-and-ring carvings on the rock, some having channels linking and running away from them, as well as a few other curious carvings; but there is more recent graffiti too, some of which is obviously from the Victorian age. It is briefly mentioned by Paul Bennett on page 56 in ‘The Old Stones of Elmet’ (2001), and there is much more information on ‘The Northern Antiquarian’ website (see below). Spencer, Brian, The Visitor’s Guide To The Yorkshire Dales, Teesdale & Weardale, Hunter Publishing Inc., Edison, NJ USA, 1986. 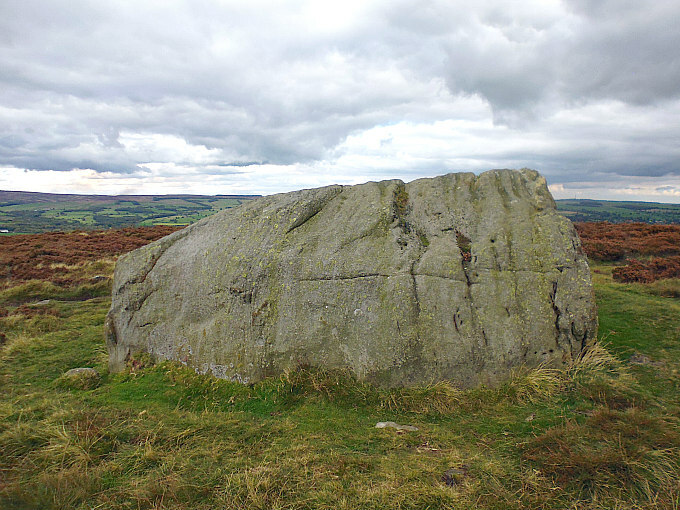 Categories: Cup-And-Ring Markings, Glacial Erratic | Tags: Haystack Rock on Ilkley Moor in West Yorkshire | Permalink.